I’m not pretty sure how many users are using the standard SQL Server Management Studio (SSMS) 2008 R2 to manage your SQL Azure database. I was one of them until I found the Houston project provided by Microsoft in its SQL Azure Labs. 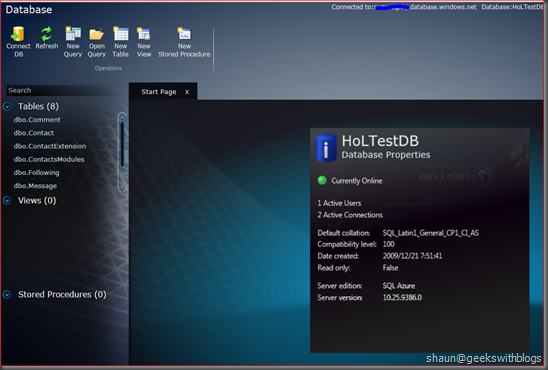 SQL Azure Labs is a place where we can try the latest CTP features of the SQL Azure. They might not be included in the production SQL Azure but I think most of them will be launched in the future. So it’s a good place for us to play with the newest stuff of SQL Azure. As you can see there are three features now provided in the labs and in this post I would like to introduce the 3rd one – Project Houston CTP 1. I was using the SSMS 08 R2 to access my SQL Azure database before. It works, but not that pretty. There are some limitation I found when I used it. I can’t use the standard design view to create and modify my tables. It seems that the SQL Azure platform doesn’t support the SQL Server Configuration Service or something else. So what I can do is to use the plain SQL statement. 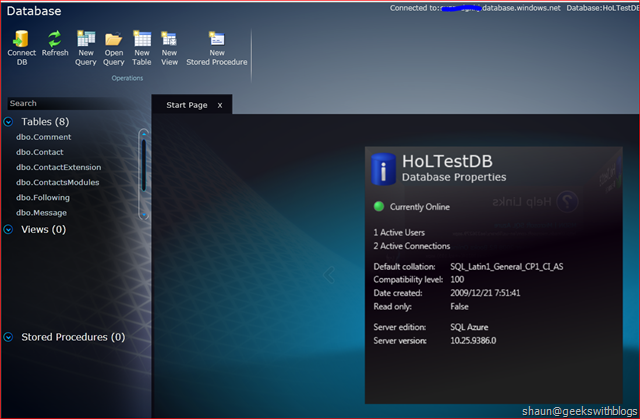 Although I can connect to my local mirror database to finished my modification and them copy and run the generated SQL to SQL Azure it still very inefficiency. 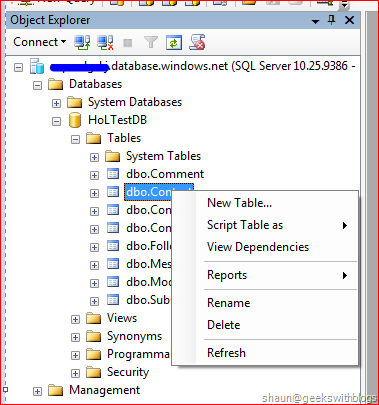 If the one above is acceptable for you since the tables schema changing was not that frequently, it should be very frustrated that the SSMS doesn't support listing the data of a SQL Azure table. This means I have to write the query manually when I need to check the rows. Since the data traffic should be charged by Microsoft each time I fetch or insert data I need to pay for them. 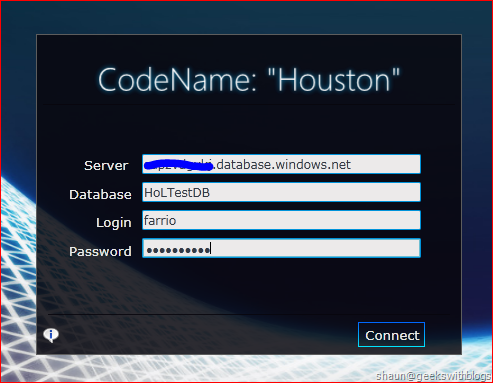 The project Houston is a web-based, in fact it’s Silverlight-based application which you can manage you SQL Azure database with more features than the SSMS. The registration is very simple. 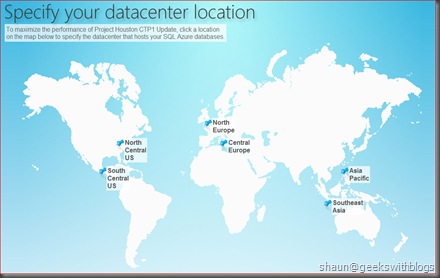 You firstly navigate to the Project Houston CTP 1 section on the SQL Azure Labs with your Live ID and then you need to select a location where the Houston will be run. 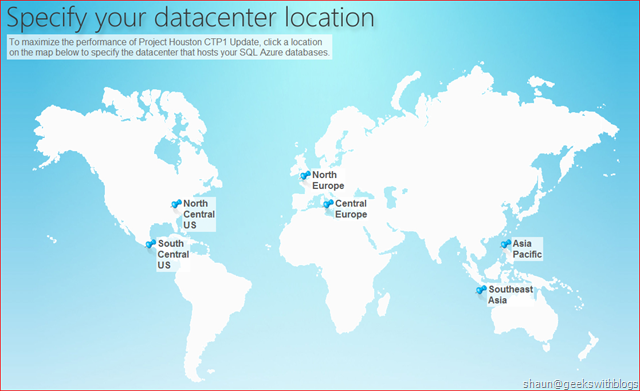 In order to maximize the performance you’d better select the same location that hosts your SQL Azure database. In my case I selected the North Central US. And then the connection and logon form appeared. Here I said “form” rather than “page” is because we have been in the Silverlight environment. 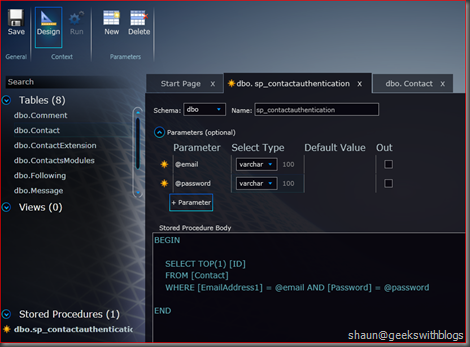 Just provide the SQL Azure database server name, database name and your account here. Note: You need to specify your full database server address in the Server box. 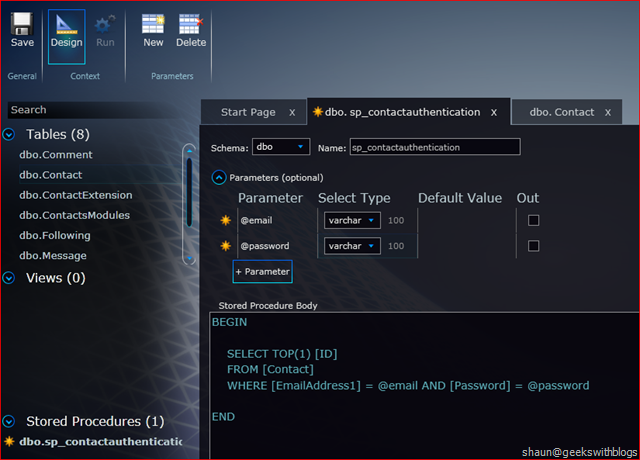 You can get the server address in your SQL Azure Development Portal. 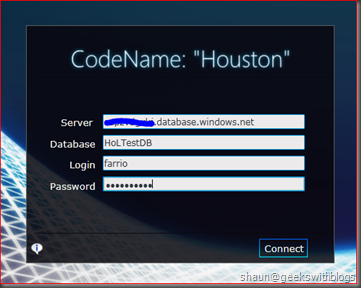 After logged into the Houston you can see the basic information of your SQL Azure server and database includes the users, connections, versions and the quota. 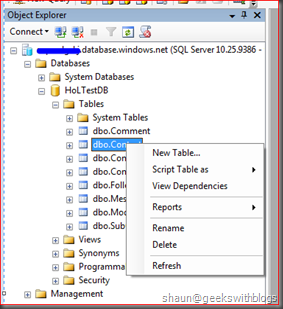 On the left there are the tables, views and stored procedures you’ve created in the database and you can create, update the schema through its design view, which SSMS doesn’t support. And just click the Data button on the top you can see the rows in a grid where you can add, update and delete them which SSMS doesn’t support neither. 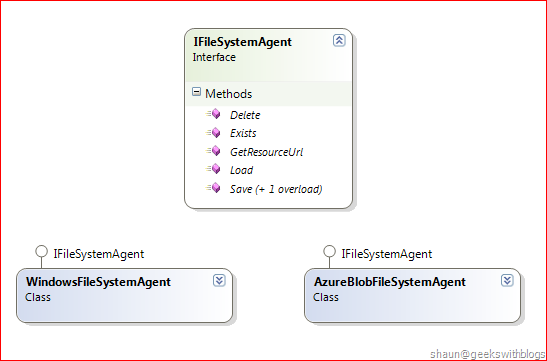 Also we can add, update our stored procedures although it doesn’t not support the IntellSense. But I think it would support in the future. 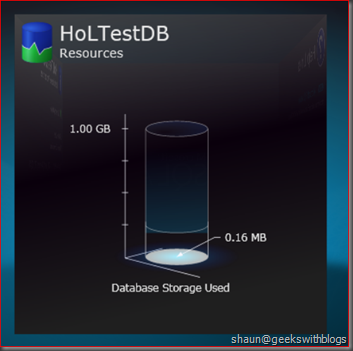 In this post I just introduced a lightweight but powerful tool for managing the SQL Azure database. It’s web-based which means we don’t need to install but it’s very rich by using Silverlight. While the Azure platform become more popular, more and more tools are available that can be used by us to improve the development efficiency. All files under the web role project will be treated as one package. This means when we deployed a web role the Azure will delete the original web application folder and files then extract our new package and initialize it. Hence all files uploaded by the users will be deleted at this moment. In some cases the Windows Azure platform may migrate your application from one virtual machine to another. But we cannot assume that the root path of our application will be the same. So if we use Server.Mappath() it might return different result. Hence when our application is running on Azure the uploaded files would better to be stored into the blob storage service. If we want to migrate a normal web application to azure-based application we need to modify all the codes for uploading the files, and maybe the code for displaying the image files as well. But now what I’m facing with is that, the web application should be satisfied with azure and normal deployment at same time. This means it’s unacceptable to change the file operation code in the business logic and UI when it’s deployed to azure and normal server. We need to make sure the code can work well on both deployment and what we can change should only be the configuration. One of the approach is that we can use Cloud Drive feature. In that way we can mount a VHD file located at BLOB storage as a local hard disk. Then it's almost no need to change the IO operations and codes. But storing the files in BLOB storage directly make bring some other benefits such as, it would be possible to access these files through URL directly. In this post I would like to introduce another way. So the challenge now is that, I need a partten to take the responsible for operating files regardless if it uses normal file system, or the blob storage service. In this post I will explain a bit about what I did and hopefully it could be useful for you when you develop the azure and normal web application in the future. The architecture is very simple. In order to make the web application depends on the abstract file operations I created an interface to isolate the implementation between the file system and blob service. In the IFileSystemAgent interface I defined the basic file operation methods such as Save, Load, Delete and Exists. The GetResourceUrl method is to be used to return the URL when we need to link the file, especially display the image file, on a web page. It could return the proper URL based on which system we are using now. 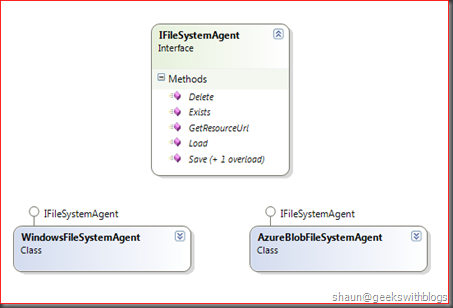 Under the IFileSystemAgent I implemented two classes one for windows file system which can be used for normal deployment, and the other for windows azure which can be used for blob storage service. The main different between these two implementation classes was not only the file operations, but how to deal with the root path as well. As we know when using the windows file system in a web application we normally use Server.MapPath() to translate the virtual path to a physical path and save or load the file. But in blob storage we need to retrieve the storage account information and upload the bytes or stream to the endpoint of the storage account. This is very different. And when we need to display or link the files on a web page, in windows file system we just need to use the relevant path for example “/upload/images/beijing-hotel-img1_50x50.jpg”. But in blob storage the path should be like “http://xlr8.blob.core.windows.net/default/beijing-hotel-img1_50x50.jpg”. Hence when saving and linking a file, the IFileSystemAgent only accept the file name with the relevant path, and the implementation class will determine where and how to save or link it. In the WindowsFileSystemAgent I passed the HttpServerUtilityBase through its constructor and also a parameter named Root which means the files will be stored at Server.MapPath(“/” + Root) dirctionary. And In the AzureBlobFileSystemAgent I passed the CloudStorageAccount and the ContainerName through the constructor so that the files will be stored at that blob account within that container. Below are the implementation code for these two classes. Let me use an ASP.NET MVC application to explain how to use it. First of all we need a helper class to initialize the instance of the IFileSystemAgent based on the configuration. Here I just created a very simple factory class to return the instance based on the value in the web.config. But if in a real project we’d better use some IoC containers to do this such as Unity. And then in a controller which handles the file upload we can use this factory to initialize the proper implementation instance of our IFileSystemAgent and just call its Save method to save the file regardless which one we are actually using now. And if we need to migrate our application between the azure and normal server we just need to modify the web.config file. Similarly when we need to display or link a file on a web page we also no need to consider where it’s being stored. In order for this I created an extension method on the HtmlHelper. With this helper method when we need to display or link a file we just use the GetResourceUrl method of the IFileSystemAgent so it will return the proper URL back. I this post I explained a bit about my solution on how to make the file operation code unified in our application especially a website between azued-based and normal deployment. There are still something can be improved in my solution. One is that we can separate the HttpServerUtilityBase and the CloudStorageAccount as an interface. For example, IRootProvider, so that they can be injected and can be fully unit tested. There also some other points can be improved for azure application migration. For example in azure we’d better put the frequently change configuration values to the ServiceConfiguration.cscfg file rather than the web.config. This lead us to build a provider for loading the configuration which I’m going to explain in the future. Note: You can download the full demo code here.